Let’s be honest, who wouldn’t want to get some food storage or preparedness gear for Christmas? You know it ends up under my tree in some form every year. 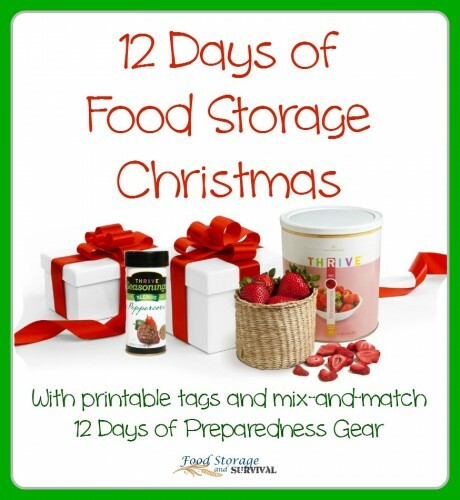 Well this Christmas I’ve got a gift for you–The Food Storage 12 Days of Christmas! Pick a loved one or unsuspecting neighbor and treat them to a little preparedness this Christmas. I’ve got a listing of the items below with some suggestions for what you could give. I tried to make this adjustable for different budgets by not specifying an amount on anything so you can give a small amount or a bucket–your choice. And the tags coordinate perfectly with the Preparedness Gear 12 Days of Christmas as well. These two sets are designed to mix and match so you can do all food storage or all gear or some of each to fit your needs and your budget! I want these to be usable, so in the tags, I even left the day number blank so you can arrange them however you want. You can copy the images from this page and make them any size you want OR I have a printable PDF file here that has them ready to print 6 to a page! All because I love you and want to spread preparedness to all your friends this year! So here it is, the 12 Days of Christmas–Food Storage style! On the day of Christmas we want to help you eat, so we’re adding to your storage this super healthy wheat! Give a bag or a can or a bucket of wheat, either hard or soft, red or white. If you can’t find wheat, get a bag of wheat flour from your grocery store. On the second day of Christmas Just follow our advice, And add to your food storage This yummy long grain rice! Give a bag or can or bucket of rice. It could be white or brown, regular or instant. You could also give instant brown rice or rice flour! On the day of Christmas we’ve got some beans for you. Put them in your storage to make a nice warm stew. Give a can of beans from the grocery store, a bag or #10 can or bucket of dry beans, or even some instant beans! Any variety works. On the day of Christmas, we’ll add this to your loot. For baking or for snacking, there’s nothing like some fruit! Give some home or commercially canned fruit or some dehydrated or freeze dried fruits! On the day of Christmas, you can’t forget the sweets! Without a bit of sugar no food storage is complete! Give a sack of sugar from the store or a can, case or bucket of sugar. You could also use brown sugar, powdered sugar, or honey here. On the day of Christmas, here’s a meal that’s quick. Put it in your food storage for when you’re tired or sick. Give a quick cooking meal. You can put one together yourself, or buy a ready to cook meal like Thrive Express or Mountain House in a pouch or a can. Mountain House pouch meals can be found in the camping section of many big box stores. You could also give a can of soup or spaghettios or something along those lines. An MRE would also work, but I think they’re gross–I wouldn’t give one to a friend! On the day of Christmas we think it would be keen, To add to your food storage some veggies that are green. Give some home or commercially canned vegetables. 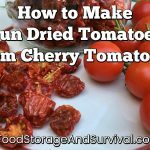 Or there are lots of dehydrated and freeze dried veggies to choose from as well! On the day of Christmas some milk is just the thing For drinking and for baking and for soups fit for a king. Give any powdered milk from the grocery store, or for some that actually tastes good, give the Thrive instant milk. Give any powdered drink mix from the grocery store. Best if it does not require added sugar so it can be used on its own. Even chocolate milk mix would work. You can also give food storage drink mixes! On the day of Christmas, because we love you oodles, we have for your food storage some awesome pasta noodles! Give any pasta from the store or cans of egg noodles, spaghetti, or macaroni! On the day of Christmas, for food you’ll want to savor, we’re giving you some spices to add to your food’s flavor. Give salt and pepper, or a bottle of some spice blend you love. You can even get the giant bottles from the warehouse stores if you want to go big! On the day of Christmas, for goodies you’ll be making, we’re adding to your food storage some soda fit for baking. Give baking soda in a can or a box from the store. Warehouse stores usually have big sacks of baking soda also. Remember, you can swap these days around in any order that works for you, and be sure to check out the Preparedness Gear 12 Days of Christmas for more gift ideas designed to mix and match with the Food Storage 12 Days! Really a Cthulhumas post and it’s not even thanksgiving? Yeah, I know. But I also know there are people already doing Christmas shopping and I know a few food storage places are going to have Black Friday sales, so I put this up so anyone who would be interested can plan ahead and get some better pricing on their gifts. I promise after tomorrow’s post I won’t have a Christmas post again until December! We were talking as a family that we want to do the 12 days for someone this year and this is a wonderful way to do it!! I love it! Thanks, Angela! This is a great idea for holiday gifts. My daughter recently got married and hardly knows where to begin in food storage. This is a simple fun way to get her thinking about food storage and the importance of it. My heart goes out to the people back east that have been hit by the hurricanes. I think these storms have made all Americans realize how important it is to be prepared for any type of an emergency. Everyone needs to start somewhere. This is a great place to start. Lovely ideas! The post is terrific! Thanks!